I FIRST SAW the Canadian Rocky Mountains from the back seat of my parents’ Dodge Caravan as we drove from Jasper to Banff, Alberta. I was 15 years old. We’d recently moved west from New Brunswick, where our local ski hill measured less than 275 meters (about 900ft). The Rockies’ peaks reach ~3,000 meters. They left an impression on my young mind. After I graduated high school I briefly moved to Banff, and I returned almost every year to ski Marmot Basin, Lake Louise, Sunshine Village, and Nakiska. In 2007, I proposed to my wife in Jasper, and we’re now lucky to call the town home. Because I’d driven the Icefields and Bow Valley Parkways dozens of times in the past decade, the trip was in danger of losing its luster. So during a recent press trip to the area, I reset my odometer at the Banff Visitor Information Centre, stashed my camera in the passenger seat, and vowed to spend the day photographing whatever caught my eye. Founded originally as Rocky Mountains Park in 1885, Banff National Park was Canada’s first and only the second in the world, behind Yellowstone in the USA. 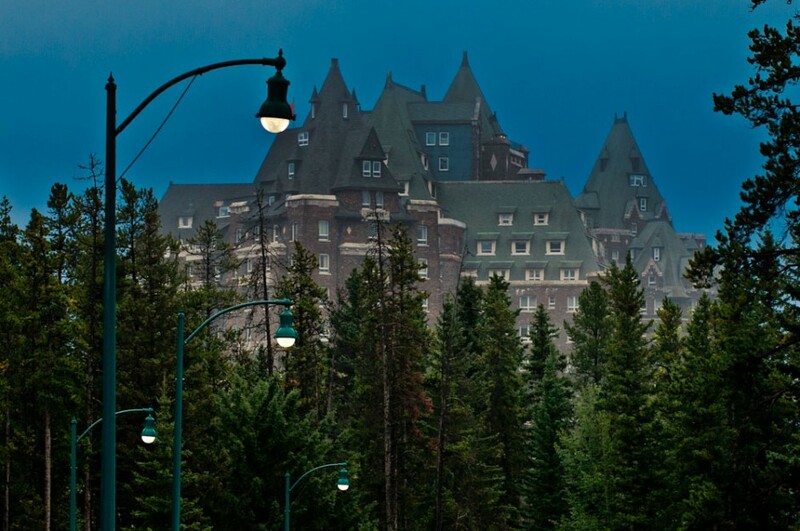 In 1888, the Canadian Pacific Railway Company built the Banff Springs Hotel to keep up with the growing tourism market within the park. Two roads link Banff and Lake Louise: the four-lane TransCanada Highway and the Bow Valley Parkway. While the former is built to handle the 4 million annual visitors and long-haul trucks bound for Vancouver’s seaports, the latter is the slow-pace alternative. The maximum speed limit is 60 km/h (about 40 mph), wildlife sightings are common, and roadside pullouts plentiful. 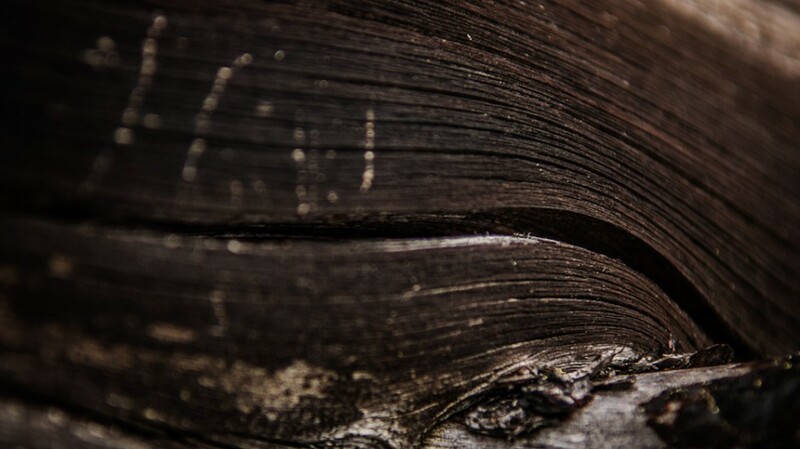 The thick green forest is replaced by burnt timber along the Sawback Range on the Bow Valley Parkway. It’s the site of a "prescribed burn," where Parks Canada employees intentionally lit 200 hectares of brush fire to renew the forest for wildlife habitat in 1993. 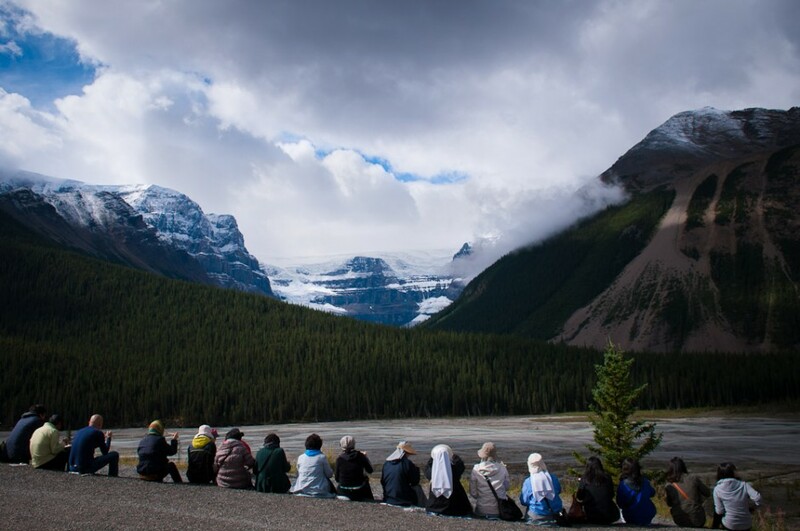 At 1,661m (5,450ft), Lake Louise is Canada’s highest community. It is also home to Lake Louise Mountain Resort, which is most famous as a winter ski destination, but throughout the summer months the gondola remains open for sightseeing. Up to a dozen grizzly bears call the mountain home, too, making it one of the easiest places to see the animals in Canada. All I saw was this killer weather phenomenon called a temperature inversion, which results when a warm air mass traps cooler, cloudy weather beneath it. 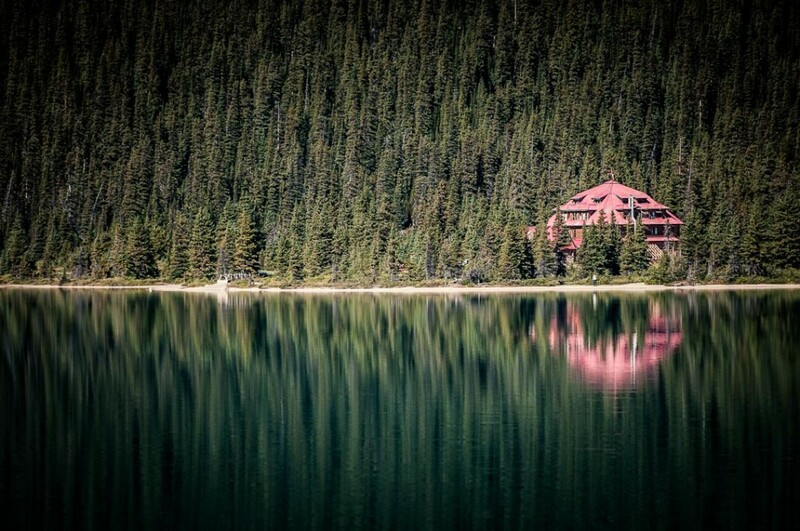 A second Canadian Pacific Railway-built hotel stands on the edge of Lake Louise. 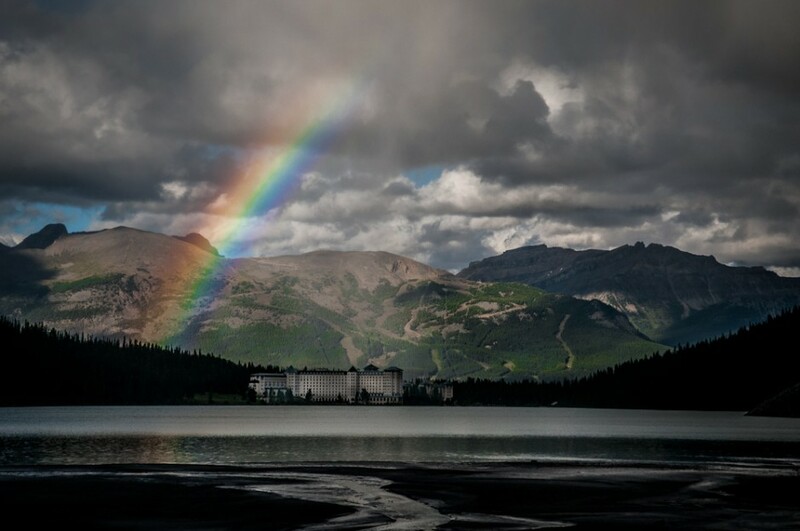 The Chateau Lake Louise originally opened in 1911, but two major fires destroyed most of the original structure and led to significant renovations. The oldest remaining section of the building is the Painter Wing, built in 1913, and the newest section is the Mount Temple Wing, which was completed in 2004. Named for the Stony First Nation’s word for "pine martin," Num-Ti-Jah Lodge is a testament to the hold the Rocky Mountains have on certain people. Nearly 30 years after discovering Bow Lake, in 1898 Jimmy Simpson returned to make good on his promise to build a lodge on its shores. At an elevation of 2,088m, Bow Summit is the highest point on the Icefields Parkway. 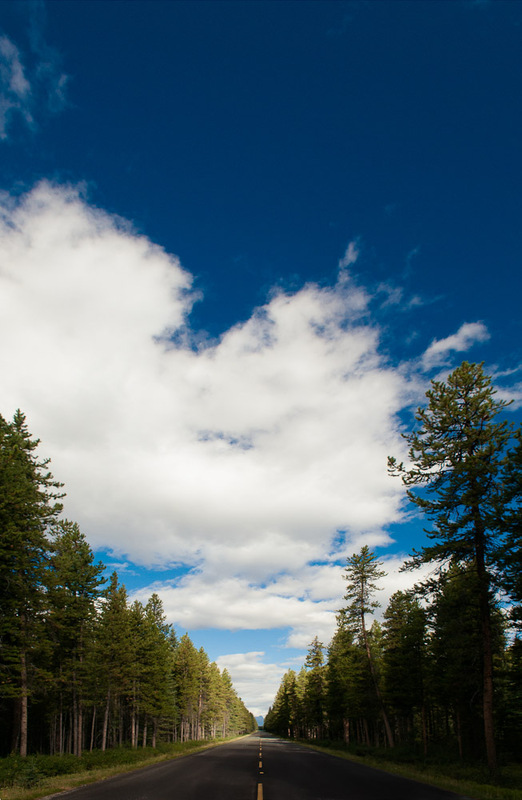 This stretch of highway is set among Engelmann spruce, white spruce, and lodgepole pine coniferous trees, distinctive of subalpine forests in the Canadian Rocky Mountains. 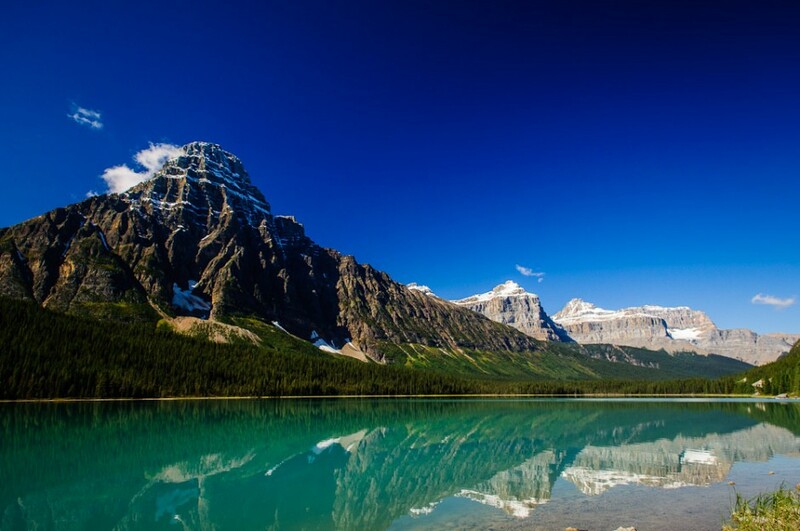 Waterfowl Lake offers a clear view of a classic glacial horn peak called Mt Chephren (keff-fren). Not only does the mountain look like a pyramid, it also takes its name from the Kephren Pyramid in Giza, Egypt. Motorists who didn’t heed warning signs posted in both Lake Louise and Jasper claiming no services for 230 kilomters can take solace (and fuel up) at the Saskatchewan River Crossing. The gas station is open throughout the summer and offers the only services on the road. A few kilometers after the Saskatchewan River Crossing, the highway climbs 425m to Sunwapta Pass in one continuous curve known as Big Bend. From the summit, the road continues past Parkers Ridge and enters Jasper National Park. The Columbia Icefield feeds seven glaciers and sits upon the Continental Divide. The glacier on nearby Snow Dome Mountain is the hydrological pinnacle of Canada, meaning its melt waters flow into all three oceans: the Athabasca River flows north into the Slave River and Mackenzie River to the Arctic Ocean, the Saskatchewan River flows east to Hudson Bay and the Atlantic Ocean, and the Columbia River flows west to the Pacific Ocean. 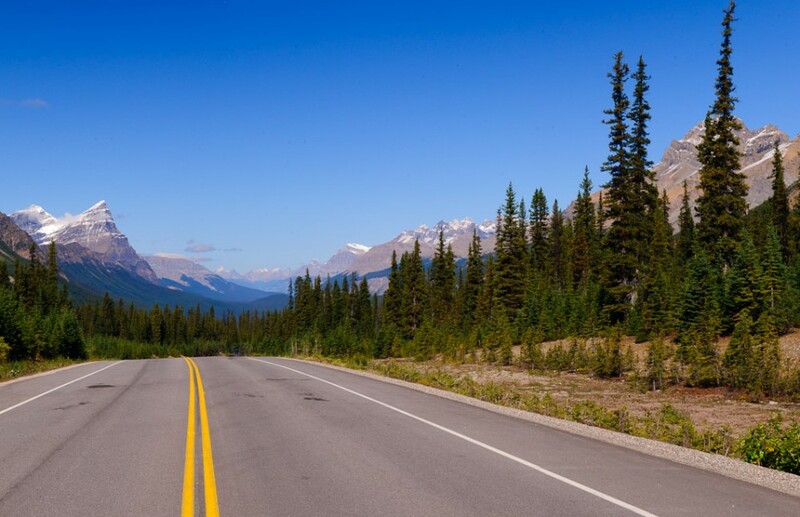 Although the Icefields Parkway traverses 230km of National Park wilderness, it is a busy road. Throughout the summer, over 100,000 vehicles drive between Jasper and Lake Louise each month. 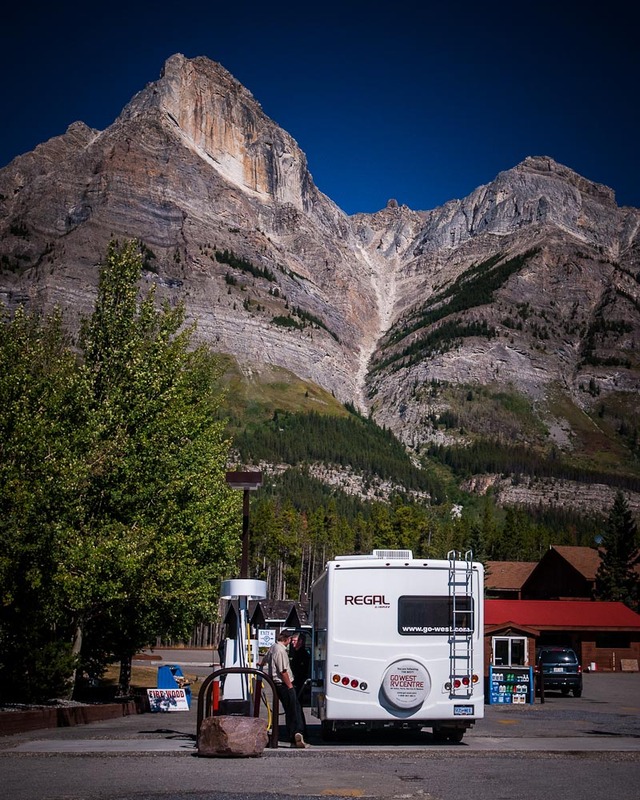 Between Lake Louise and Jasper, accommodation options come in three types: 11 Parks Canada campgrounds, 5 Wilderness HI hostels, and 4 independently owned, seasonal resorts. 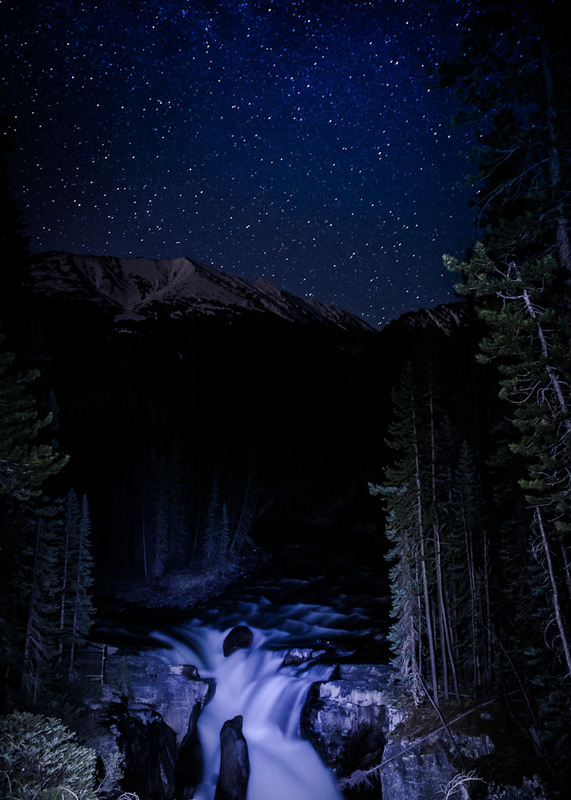 The Sunwapta River flows along the Icefields Parkway from the Athabasca Glacier to Sunwapta Falls. A walking bridge spans the gorge above the falls, which have an 18.5m vertical drop. The bridge also marks the beginning of a 24km overnight hike to Hamber Provincial Park in British Columbia. 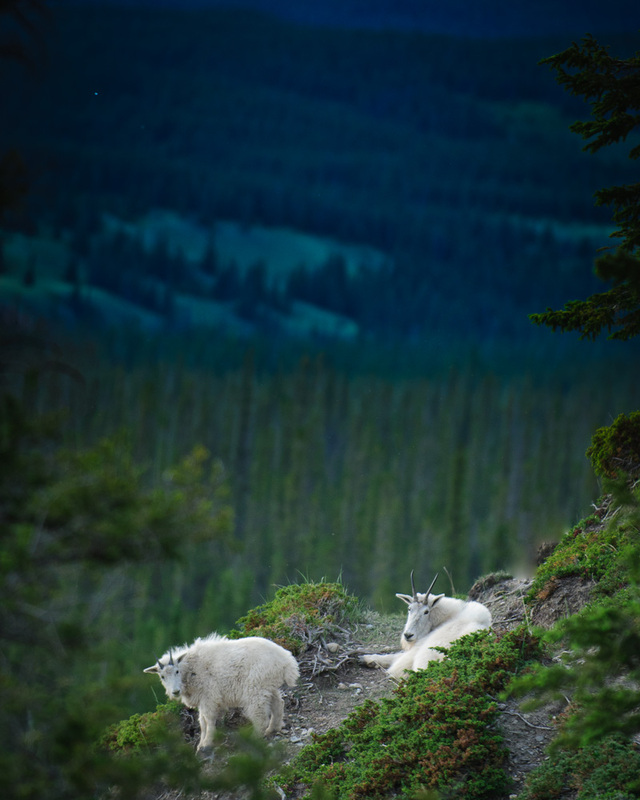 Mountain goats are typically found in the alpine and subalpine zones; however, this viewpoint near Sunwapta Falls has several exposed mineral deposits, called salt licks, which provide essential nutrients to the animals and draw them to lower elevations near the highway. 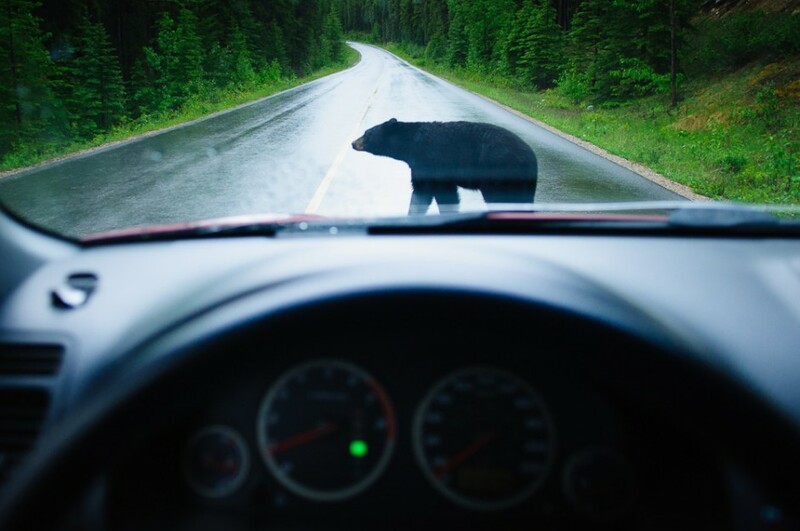 Wildlife is a common sight on all roads in Jasper National Park, but few animals command the attention we give a black bear. Locals use the term "bear jam" to describe any blocked road caused by carloads of people stopped to photograph the animal. Not only is Jasper half the size of Banff, but it also sees half the annual tourist visits. Many hotels and local business operate seasonally; however, Marmot Basin Ski Area does make it a year-round destination. The Canadian National Railway Company continues to be a major local employer, and its presence helps maintain a blue-collar atmosphere that's absent in many mountain towns.